Scoil Bhríde teaches the Curriculum in accordance with the directives of the Department of Education and Science. 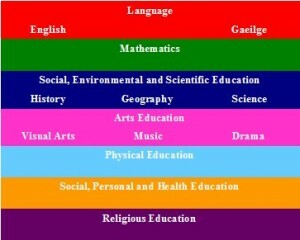 The Primary School Curriculum celebrates the uniqueness of the child, as it is expressed in each child’s personality, intelligence and potential for development. It is designed to nurture the child in all dimensions of his/her life. The curriculum recognises the integrity of the child’s life as a child and aims to cater for his/her needs and potential as they evolve day by day. ICT. We have interactive whiteboards in all classrooms.